Swift's 77-yard touchdown run in the third quarter capped Georgia's ninth win of the season. Is it too late to throw D'Andre Swift's hat into the ring for Heisman Trophy consideration? 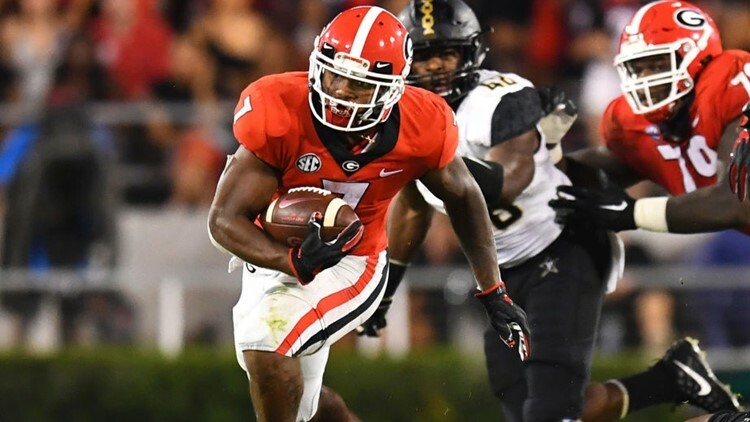 On Saturday night, the sophomore tailback absurdly notched 229 total yards (186 rushing) and one touchdown in UGA's 27-10 home rout of No. 24 Auburn, with all the yardage coming in the first 47 minutes of action. The opening line (above) might have read like a joke to casual SEC fans, since Alabama QB Tua Tagovailoa has been the obvious Heisman front-runner for a few weeks. There was also the little matter of Swift entering the weekend with only 622 rushing yards and seven touchdowns–hardly Heisman material during November. Charting his last three outings–highlighted by Saturday's 77-yard touchdown run–Swift boasts surreal averages of 173 total yards and 1.3 touchdowns; and keep in mind, all three games involved ranked SEC opponents (Florida, Kentucky, Auburn), with heralded defenses to match. What's more, Swift has averaged nearly 10 yards per carry during this prodigious stretch. Could the Dawgs reach the College Football Playoff as a two-loss team? In the short term, the answer's no, since Alabama, Clemson, Notre Dame and Michigan (top 4 teams in the College Football Rankings) all posted impressive victories on Saturday. However, factoring in Oklahoma's shaky home win versus Oklahoma State and Michigan's looming trip to Ohio State (in two weeks), the second herd of genuine Playoff contenders might be thinning out at a faster-than-expected rate. And if UGA should push Alabama to the brink of exhaustion three Saturdays from now (SEC title game at Mercedes-Benz Stadium), who knows how the Playoff committee would view such an occurrence? Perhaps the Bulldogs are the nation's second-best team ... and no one realizes it yet. In the meantime, the optimistic Dawgs fans should like their burgeoning chances of knocking off Alabama ... and a lot of credit goes to QB Jake Fromm (193 yards passing, two crucial TDs in the first half) and the aforementioned Swift, who's suddenly dominating college football like no other. Georgia Tech endures its share of guff locally and nationally for running the triple option, a so-called boring offense to those who favor college and pro teams attempting 40 passes per game. And yet, Georgia gets a relative free pass from the masses, even though this version of the Bulldogs routinely eclipse the 40-carry threshold (team-wise). Saturday's cumulative tallies: UGA (9-1, 7-1 in SEC) ran the ball 46 times for 303 yards and one touchdown. As such, we'd be willing to bet the following: From a straight real-time perspective, no one has enjoyed shorter fourth quarters than UGA this season (read: many blowout wins). When the Dawgs are sitting on a double-digit-point lead in the fourth quarter ... you might as well warm up the bus and head for the exits, because the end is nigh. It's the simple result of a demanding head coach (Kirby Smart) utilizing the skill sets of an immensely talented backfield ... and a massive offensive line. Without the slightest bit of pretense or guilt.